My journey towards a vegan lifestyle has made one thing very clear: PREPARATION IS KEY! From doing your research before beginning a new diet, to planning your grocery shopping trips and weekly meals, being prepared and planning ahead can make the difference between a healthy, tasty meal and a processed dinner from a box. For me, I always head to Whole Foods on Monday after work. I choose to travel a bit out of the way to this particular store because of the beautiful organic fruits and veggies that they offer. The employees are always super friendly and extremely helpful when you have questions and concerns. The first time I picked up a bag of Daiya cheese, I asked the checkout clerk if he had ever tried it and what it tasted like – I explained that it was my first time and I was nervous about the difference. He was nice enough to comp the entire bag for me so that I could give it a try without any worries. Such a great company model! Once it begins again, I will also be grabbing some items at the weekly Farmer’s Market in my neighborhood. Even though it’s not the biggest, i love walking through the stands and seeing the same familiar faces each week. It makes me feel good to support local farmers while also getting quality ingredients for myself! Depending on what you plan to make each week, you may need to make more than one trip to the grocery store in order to have the freshest produce possible. I tend to plan meals that use veggies that stay fresh in the fridge the longest for the end of the week since it’s tough to find time to head to Whole Foods twice a week. Because my shopping day is Monday, I use about an hour or so on Sunday to plan my meals for the week. I try to try a few new recipes each week, but I take into account what I already have in the kitchen so that I am not overspending. I also think about portion sizes – I’m cooking for myself during the week, but I also like to pack my lunch for work so that my diet doesn’t suffer. So, I typically make between two and four portions of everything so that it lasts. Things like soup and pasta sauce get frozen and saved for a later, busier week. One of the biggest assets to my dietary change has been AllRecipes.com. Not only have I been able to find a ton of vegan recipes, but I have found vegetarian recipes that I have been able to adapt and other recipes that contain meat that have inspired some of my veggie dishes. One of the features that I like the most is the ability to create your own virtual “Recipe Box” and create a “Shopping List” from those recipes. I use the shopping list feature to add ingredients from other recipes not found on the site so that I can work from one list instead of multiples. It only takes a second to create a free account and all of these great tools are at your disposal (I will be writing a more detailed AllRecipes post soon). 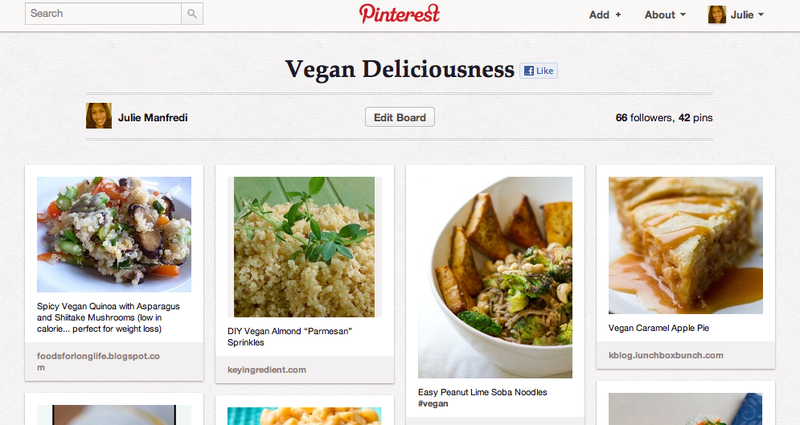 Pinterest has also been a HUGE help with finding new vegan recipes and recipes that cabe adapted. I follow other vegans that I know in real life and from other social media sites (like Twitter) and I am able to see the recipes that they pin and re-pin. About once a week, I also do my own search for recipes with the #vegan label on them and pin accordingly. Whenever I am browsing the web on my own, I use the “Pin It” feature in my browser to add great recipes to the Pinterest world. Using Pinterest helps me to keep all of the recipes I find from different blogs in one set place – I never have to wonder where a link is when I need it! Here’s a link to my board called “Vegan Deliciousness” – it has images of vegan recipes that I’ve pinned (just click on the board name). I’ve tried some and I’m looking forward to making others! When I made the decision to begin phasing out animal products, I set aside a couple of hours to really clean out my fridge. I tossed everything that might have been out of date (healthy or not) and everything that was chock full of sugar, preservatives, and animal products. I took everything out that was left and gave the fridge a thorough cleaning and then organized the food into new, easier to handle sections – things like citrus fruit, which tends to give more juice when it’s room temp, got moved to the fruit bowl outside. Instead of stacking layers of veggies on top of each other in the drawers, bruising them easily, I use trays and containers to lay them out. It also makes everything easier to see – I love all of the awesome colors that wind up in the fridge after shopping day! I found a great list of ways to organize and store specific fruits and veggies on a blog called “My Thirty Spot” – click here to read about the various ways you can maximize the life of your produce! I like to try to prep certain food items ahead of time, if at all possible. Things like cutting hulling strawberries and chopping celery for smoothies can be done days in advance. If I buy something like a whole pineapple, I will cut it up whenever I have a free few minutes so that it is ready for recipes and a healthy snack. I also try to group recipes together that have a common ingredient – something like fresh garbanzo beans. Fresh beans need to be soaked before being cooked, so I will make a ton of them and then use them in various recipes for the week. By doing small prep ahead of time, you will save yourself some hassle and work later in the week when you may not have the extra time. These are just a few tips for staying organized and being prepared. Without preparation, we often wind up spending unnecessary money on meals out or we compromise by eating something fast but not as nutritional as something we could have prepared. Think ahead – the worst feeling to have, in my opinion, is being unprepared! What are some of your tips and tricks for staying on top of a healthy, plant-based diet? Please share them in the comments below! I need to do everything you just listed.